I mentioned earlier this month that I got a new phone for work. This is not just any phone, but the Android powered Hero from Sprint. The phone itself is sleek and just plain awesome; everything the iPhone has become, without any of the ATT/Apple strings attached. The iPhone app store equivalent, the Android Market has about 10,000 apps and because the Android OS is open source, the majority of these apps are free. I thought I would demo as many as I could handle this past few weeks in relation to personal finance and here are five of my favorite Personal Finance related Android apps, with key points in bold. Personal Assistant, by PageOnce is just that, a personal assistant. It has the ability to store a plethora of information such as bank account, credit card accounts, investment portfolios, appointments and it can even keep track of your Netflix queue and eBay auctions. With the bank accounts, once you add your accounts, the app organizes things very nicely to show balances as well as having detailed lists of all transactions. The app does the same thing for credit card accounts. One notable thing about the application is that it will send you emails when it detects something abnormal such as possible fraudulent purchases. The financial summary portion of the app is a great way to look at all your financial activity very quickly. I’m very impressed with the applications user interface. Everything is slick, adding an account was easy and painless, and everything performs pretty well. Personal Assistant has two versions (free and $9.99), with limits on the number of accounts that you can add for the free version but I find the free version sufficient. One of the coolest things I found out about the Android phone is that it has the ability to scan barcodes. There are probably two dozen barcode scanning apps at least but this is the one I found to be the easiest to use and most feature rich. After you scan a barcode, the app will automatically search online for the specific product as well as locally based on your GPS coordinates. It will give you seperate comparisons for all online locations and all local locations. The results all come up on the phone so there is no need to open a web browser unless you want to view the actual website selling the product, which makes the comparison much quicker, all on the phone. Some of the other features the app has are the ability to save searches if the product isn’t found, so if the product is added to the applications database, it will alert you. The app also has a price alert which will email you if the price changes to your defined threshold, wishlists to keep track of things you want to buy, and a history of all the things you have scanned. Some of the other barcode apps I tried took a while to actual read the barcode, but I found the actual process of scanning with ShopSavvy to be quick and easy because of onscreen feedback and positioning assistance while scanning barcodes. A grocery list or price book is basically a list of things you buy and the price you paid so you can keep track of how much you paid, know when a sale is actually good or not and save on things you purchase often. Upvise is an app suite with contact management, RSS feeds and portable Wiki but the app in the suite that I got it for is the shopping list. I tried several shopping lists but none could compare to Upvise. Essentially Upvise shopping list is a shopping list that you add all the things you need to buy onto the list. Then when you are at the store you can easily check off the things you bought but in this simplicity lies the complexity. The app also gives you the ability to record tons of information about the product such as price, quantity, units such as weight, packages, boxes or bags, and even isle number. The items you create are then stored in a database on the phone, so you add them to a “Buy list” when you need to buy them, and after you buy them, they are moved to an “All Items” list and stored till next time you need them. This alleviates the annoyance of having to re-add all the items you need to the list and it also accomplishes what Grocery Lists or Price Books do, such as recording the price so you can compare with the same item the next time you need it. The app has the ability to add categories to the items on your list and create multiple lists so you can maintain a shopping list for each store you go to such as the hardware store and grocery store, or a list of Christmas presents you are shopping for. All the items added to the application are swappable from list to list, or addable to multiple lists so once you add something, you can just move it around. I think the most exciting feature of the app though is the online interface. Typing things on your phone, even one as comprehensive and sophisticated as the Hero can be cumbersome, but with a web interface you can just type in all the things on your list online and the web database and phone database are periodically synced. You can add the items you need to your list online, and then when in the store, add the rest of the information for the item such as price and weight into your phone, and it syncs with the web database. One of the first apps I got when I got my phone was the Mileage app. The concept is pretty simple, you record your odometer reading at each fill-up along with the gallons of fuel purchased and the purchase price. 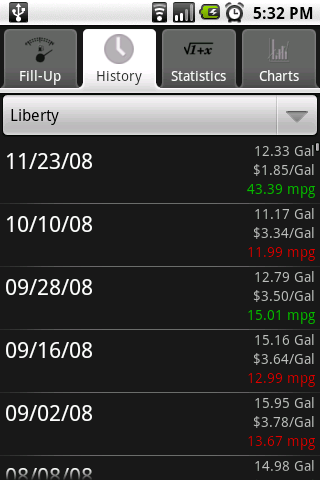 The app automatically inputs the date (though you can change it if necessary) and saves each of your fill-ups. The great thing about the app though is that after you have entered some fill-ups, the app will use that data and give you information about your gas usage such as your average MPG, best and worst MPG, average amount paid for gas, the amount of gas you have purchased so far, the amount you spent on gas any given month or year, distance between fill-ups, and even a projections about future usage. The app doesn’t stop there, it also has pretty charts for all of this information and more. Something else I discovered about the app while writing this post is that the app can record service information and alert you when you need service of any kind, not just oil changes. It checks your odometer input against the service info you want to know and tells you when you need to change your air filter, get your oil changed or rotate your tires. It has the ability to handle multiple vehicles as well. How could I do a post about Android apps without highlighting Google’s own Finance application. This app is basically everything you get when you go to Google Finance, but on your phone. The user interface is nice and simple. The app gives you data and news about the major markets as well as quotes you search for. The best thing about the app is it has the ability to pull portfolio data you enter into your Google Finance account. I was even able to import my transactions from my broker into my Google Finance account so this app shows ups and downs based on my purchase prices for stock. The quote search is comprehensive and will auto-complete for you so you don’t have to remember all those ticker symbol. It can even search by company name. The app also comes with a widget that can be added to your phones main screen. My only complaint about this app is the widget will only do individual stock tickers, and not your entire portfolio but overall it is a great app. And there you have it. If you have an Android powered phone or plan on getting one in the future, these apps are all excellent and worth a try. Persuasion at its Best – Have You Been Taken? .-= Kyle´s last blog ..Is Who You Are What You Do? =-. you’re right, there are a TON of bar code scanning apps. 😀 the one i think is really cool is called Key Ring. you scan the bar codes of your grocery store member cards into your phone so you don’t have to carry all of them on your keys. SO glad they made that app! By the way, welcome and thanks for stopping by and leaving your comments! There is Price Book application on Android market. You can search and try “price book”. Also note an app called tracklet. Confusing but well documented and interesting interface. Allison, great list. Some of your, I passed up because I didn’t find them useful in my daily life, but that doesn’t mean they aren’t useful to others. The Android platform is growing everyday and I’m sure there will be many more apps in the financial sector in the future. ‘ll have to check out mileage. .-= Hedy´s last blog ..Disney Discount-Free Dining is back for everyone =-. Upvise rocks. They keep making it better and better too! Thanks for stopping by. What do you think of these five? I particularly like the looks of shop savvy. Your grocery shopping will be so much more economical! Ya Shop Savvy is great. I have all of those apps except the first one and google finance. What am I doing without google finance. Well I have it now. Thanks for the app tips. This is not a personal finance tips but the Google Sky Map app is amazing. I haven't found a stock ticker app that beats Google finance, especially since it syncs with my Google account so if I update my portfolio online, my app stays up to date. I agree about the Sky Maps, that's really fun to use! 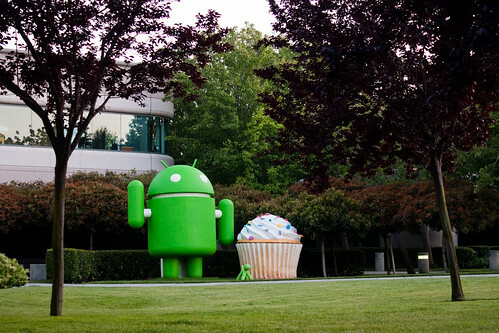 I’m a huge google fangirl and love android and google finance! Another app like google finance is the wikinvest portolio app that lets you link to you brokerage account. cool thing about this is, I get kind of live updates of my stocks and my holdings and news and everything without having to manually edit it! Get in line sister! 😉 I’ll have to check out wikinvest and see how it stacks up. Cool. I’ve used EasyMoney before too, but it seems a bit persistant to me always wanting to stay active and taking up memory. I would add MoneyWise. Nothing more powerful than tracking your expenses and respecting a budget. I’ll be sure to check it out. Considering the impressive growth of Android since this and even it’s followup were written, there are probably a lot of new apps I have to add. Check out “My Money” on android market. Its such as you read my thoughts! You seem to understand so much about this, like you wrote the e-book in it or something. I feel that you just can do with some percent to power the message home a little bit, but instead of that, that is excellent blog. A fantastic read. I will certainly be back. and Show 10 year summary of main key statics parameters, Among them EPS, BVPS, ROIC. and even give you an estimated PRICE TARGET from leading Analyst companies. shai on Is Auto Assure a Scam? shai on Amazon Prime Review – Is It For You?